Hot, dusty, frenetic…all words you’d associate with a day in Marrakech. 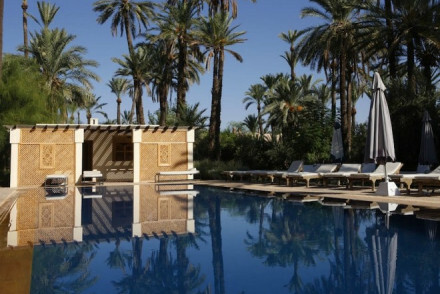 So what you’re looking for at the end of that day is the best Marrakech hotels with pools. Whether simply a small plunge pool in the heart of an interior courtyard or a larger offering surrounded by alluring loungers; a hotel with a swimming pool really is a must. There are many reasons to visit Marrakech. It’s only three hours flying from the UK, the weather is reliably good and the atmosphere at Djemma el Fna is something everyone should experience at least once. Because of these and many more reasons besides, Marrakech is an increasingly popular destination with an ever growing myriad of places of stay. 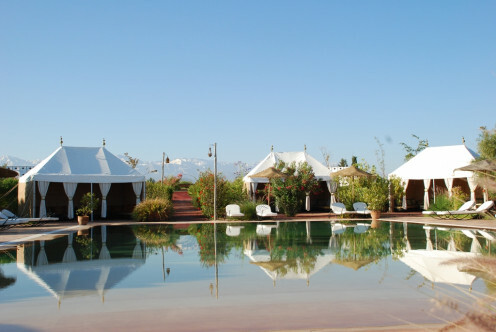 Our selection of Marrakech hotels with swimming pools will help you narrow down the choices. We only select properties which offer something a little special, whether it be superb service, gorgeous bedrooms, delicious food or in these cases fab pools. The majority of our Marrakech hotels can be found in the Medina, but this does not necessarily mean that there is no outside space. You’ll often find a hidden courtyard with plunge pool plus a roof terrace with stunning views over the city. 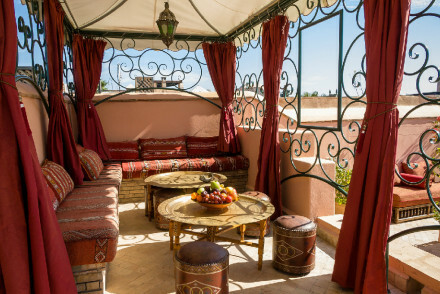 Riad al Bushra is located in the heart of the Medina, and as well as a plunge pool for cooling off, it offers a fab roof terrace and all suite accommodation. It's also well know for its friendly vibe and is great value too. Riad Jaaneman is right in the heart of the medina, and it too offers a tropical plant filled courtyard with plunge pool for cooling off. The five luxurious rooms are traditional in style and the vibe is understated elegance throughout. English owned and run Riad dar Zaman is another central pick. The four chic rooms are traditional in style, plus there's a leafy courtyard with all important plunge pool and roof terrace with views over to the Atlas Mountains. Riad Sapphire & Spa is a seriously stylish option with eight beautiful suites and a larger than average pool. Plus there's a hammam and delicious moroccan food. If you venture just twenty minutes from the city centre you’ll find yourself in the leafy Palmeraie district. Here, outside space and a decent sized garden is the norm, so pretty much every property has a pool – it’s more a case of sorting out the best hotels to stay in. 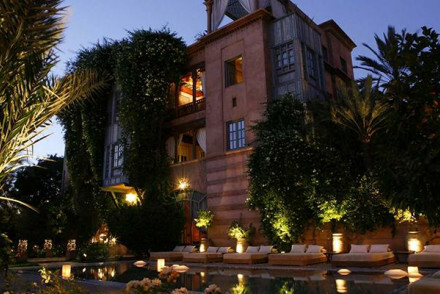 Jnane Tamsna has long been one of our favourite places to stay in Marrakech. It's set in nine acres of lush, landscaped gardens and as well as five pools, there's a tennis court if you're feeling really energetic! Les Cinq Djellabas offers a spot of unashamed barefoot luxury. 10 eco-friendly African style thatched lodges offer sumptuous interiors and all are dotted around a divine swimming pool – which is heated during the cooler winter months. Dar Zemora is one of the Palmeraie's best kept secrets. Here you'll find just six beautiful rooms, gorgeous gardens, fantastic food and pool surrounded by teak loungers. Mosaic Palace Aziza is a romantic, secluded hotel offering luxurious accomodation, plus a pool, spa and two on-site restaurants. Perfect for couples who want to escape the crowds. Dar Rhizlane is located in L'Hivernage district, a lively spot just outside the centre. Here there's a spa, tranquil gardens and pool, plus gourmet cuisine, and no young children in sight! Dar Ayniwen is a romantic's dream - eight suites with elegant interiors, five acre gardens, delicious Moroccan food and that all important pool for cooling off! There's no shortage of great value accommodation in Marrakech and we're lucky enough to have found some that even have a swimming or plunge pool. 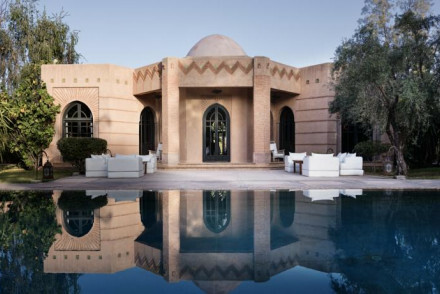 Villa al Assala can be found in the Palmeraie, just ten minutes from the souks. The rooms are simple but very spacious and the large pool is perfect for unwinding. Plus you can stay for as little as €75 per night. 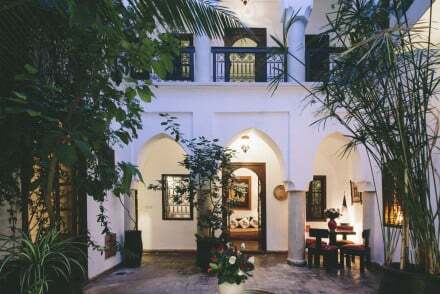 Riad Shambala offers a lovely blend of old meets new and East meets West. Rooms are simple but stylish and there's a little couryard pool for cooling off. Doubles start from only €65 B&B. Dar Layyina is situated just 15 minutes from Marrakech. With only seven rooms and suites, it's an intimate property which boasts lovely grounds including two outdoor pools, one heated for the cooler months. Doubles start from just €70 per night including breakfast. Jardins d'issil is also just outside Marrakech (about 8 miles). Here you'll find a charming cluster of Caidal tents (all with air conditioning) arranged around a fabulous infinity pool. There are great on site facilities including mini golf and the family tents sleep up to four. 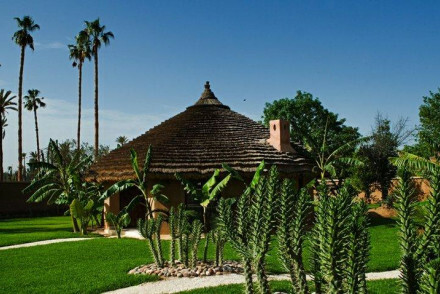 Palais de l'O is another great option in the Palmeraie. It offers a wide range of accommodation with plenty of options for family groups, separate children's pool, and babysitting on request. Nothing here that fits the bill? 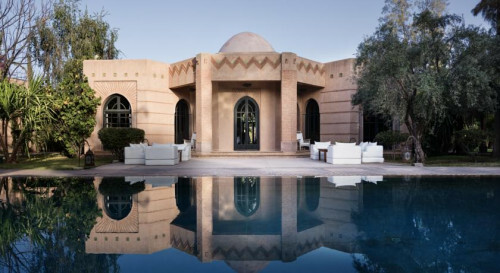 Check out all our recommended properties in Marrakech or contact a friendly guru for advice.